The purpose of this study was to determine whether the γ-aminobutyric acid (GABA) affects the rate of brain protein synthesis in male rats. Two experiments were done on five or three groups of young rats (5 wk) given the diets containing 20% casein administrated 0 mg, 25 mg, 50 mg, 100 mg or 200 mg/100 g body weight GABA dissolved in saline by oral gavage for 1 day (d) (Experiment 1), and given the diets contained 0%, 0.25% or 0.5% GABA added to the 20% casein diet (Experiment 2) for 10 d. The plasma concentration of growth hormone (GH) was the highest in rats administrated 50 mg and 100 mg/100 g body weight GABA. The concentration of serum GABA increased significantly with the supplementation groups. 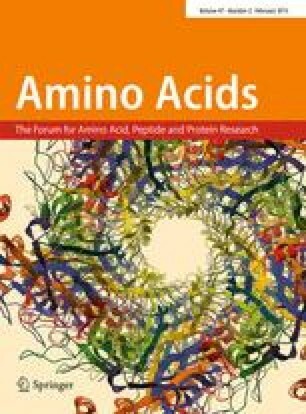 The fractional (Ks) rates of protein synthesis in brain regions, liver and gastrocnemius muscle increased significantly with the 20% casein + 0.25% GABA diet and still more 20% casein + 0.5% GABA compared with the 20% casein diet. In brain regions, liver and gastrocnemius muscle, the RNA activity [g protein synthesized/(g RNA·d)] significantly correlated with the fractional rate of protein synthesis. The RNA concentration (mg RNA/g protein) was not related to the fractional rate of protein synthesis in any organ. Our results suggest that the treatment of GABA to young male rats are likely to increase the concentrations of plasma GH and the rate of protein synthesis in the brain, and that RNA activity is at least partly related to the fractional rate of brain protein synthesis.